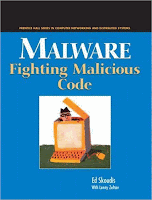 I recently saw the book Malware: Fighting Malicious Code on one of my team members desk at work. The book is not really about self sentient code like the one Skynet or V.I.K.I. from iRobot and not even remotely close to HAL 9000. It describes code in malware aimed at doing all kinds of things to ones' computer that its user didn't intend for such as deleting files or networking with other computers to infect them. What occurred to me is how as humans it is much easier to either relate to something or antagonize from it through anthropomorphism, the attribution of human characteristics to non-human creatures and beings, phenomena, material states and objects or abstract concepts (Wikipedia). That book title disturbed me because it implicitly relinquishes responsibility. The code is not really malicious. It simply executes the way a human or several humans programmed it. There was a malicious human that decided to invest time and write destructive code and then more time to push this code to the Internet and other computers and cause unsuspecting people to unknowingly execute it. Generations upon generations of kids get moved by Bambi, the young deer, in the Walt Disney movie from 1942, because apart from having four legs, spots, a tail and a snout, he is as human as human can be - he talks, for example. Disney movies used this technique probably dozens of times with great success. It's true that as far as technology goes, the borders are blurring and technological artifacts seem to have personality. One shouldn't confuse recognition abilities (of hand writing, voice commands, etc.) with cognitive skills. Sometimes technology is masked as mimicking a person, like the TurboTax INteractive Agent (Tina), though it becomes very obvious very quickly that Tina is no more sentient than the IRS tax code - she's a face on top of nothing more than a search box. Growing up playing the violin many people called their instruments with human names. I am imagining it helped them to connect with the instrument better while playing and maybe even having the unconscious notion that the instrument has a soul of its own that will help with the performance. Finally, even the space world is not immune. 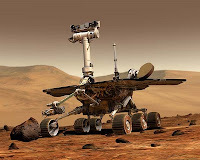 Last year, Spirit (note the name) got stuck on Mars in what was, according to this article, described by the lead scientist for the Mars Exploration Rover project as an insidious trap. Looking up the definition for insidious it is clear intent is involved, which I doubt the mud on Mars had any thereof.